Hope you didn't just buy an Xbox One in anticipation of Titanfall, because Microsoft is about to give the game away in a limited-edition bundle. 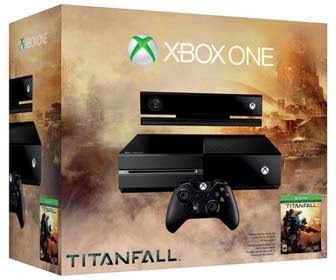 The Titanfall Xbox One bundle will be available on March 11 for $500, the same price as a standalone Xbox One console. It includes a download code for a digital copy of Titanfall and a free month of Xbox Live Gold, along with the usual wireless controller, Kinect sensor and wired chat headset. Microsoft is currently struggling to keep pace with rival Sony in console sales. While Sony's Playstation 4 has sold 5.3 million units to consumers, Microsoft has shipped just 3.9 million units to retail stores. The lead could have been wider if Sony was able to keep up with demand during the holiday shopping season. Adding a Titanfall Xbox One bundle will probably help get more shoppers off the fence, given that the game would otherwise cost $60. For Microsoft, offering a download code instead of a physical disc should reduce costs. If you did manage to hold off on an Xbox One purchase until now, you can pre-order the Titanfall bundle through Microsoft's Website.